When a man feels unwell, he goes to an expert on assessing the body: a doctor. The doctor has the experience, knowledge, training, certifications and licensing that qualify him to present an informed and accurate solution to the man’s problem. As such, when you’re searching for an irrigation professional to install a system into the yard, help conserve water, or maintain or renovate an existing irrigation system, you should go to an exterior water expert: a reliable, certified irrigation professional in Howell. As a consumer, you have the right to conduct thorough research to ensure the professional you hire will perform the job to the standards and quality you expect and deserve. Use this guide to determine the qualifications and relevance of each irrigation professional you interview. Start by assessing the professional’s qualifications. A reliable, certified irrigation professional should be able to tell you about his or her formal training, references, certification by the Irrigation Association and contractor’s license. These items show a Howell contractor has demonstrated basic knowledge and skills required for the job. Plus, IA certification means the contractor has passed exams that demonstrate in-depth knowledge of proper irrigation practices, as well as a continued interest and dedication to the subject matter through continuing education and renewal of the required certification. Other qualified organizations that offer proper irrigation training include irrigation equipment manufacturers, colleges and trade schools. A contractor should be able to readily provide proof of professional certifications, training and any state or local government-required licensing. A contractor should also have a basic business license. A professional irrigation business should also be able to discuss with you how it provides safety training and education for its employees to ensure they perform their work in a safe and consistent fashion. Belonging to various trade associations also shows a contractor’s commitment to the industry and desire to keep up with technological advancements and irrigation standards and trends. Reputable and reliable irrigation professionals will carry appropriate insurance policies to protect you and your property. These include worker’s compensation insurance to protect you from potential liability if one of the contractor’s working on your property gets hurt while on the job, and general liability insurance for residential work to protect you in case of unexpected and unintentional problems on your property like flooding or landslides. Any professional, reliable irrigation contractor should be able to provide you with certificates of insurance. 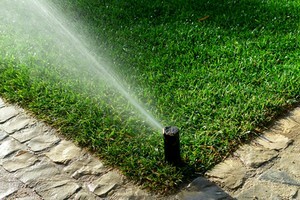 When seeking a professional irrigation contractor, obtain more than one bid so you can compare prices and work offered. Request all bids in writing and make sure they include the same details, such as irrigation product brands. The lowest price is not always a sign of the best contractor. The required licensing and certification does cost more for a contractor, and obtaining these documents make him or her more qualified to do the work. When you do choose a contractor, insist on a written contract for your protection that includes proper identification including names and licensing numbers, a complete description of the work to be done and materials to be used, payment arrangements, details on product or work guarantees, approximate date when the work will be completed, and a statement saying the contractor will cleanup and remove debris after the job is finished. If any changes are made, ensure they are made in writing as well. Most importantly, an irrigation professional should have in-depth knowledge of how to properly assess the water needs of your property, how to design an efficient system that saves you water (applying only what’s necessary) and how to educate you on proper system use for maximum benefits. A contractor should be able to detail approximate water requirements for your specific property, provide rain/soil sensors to avoid overwatering and describe how the system will be split into zones targeted for each area and for maximum coverage and minimum – if any – unnecessary runoff. A smart irrigation system is only as smart as the professional who installs it and then the customer who uses it. Get smart today and hire a reliable, certified irrigation professional!